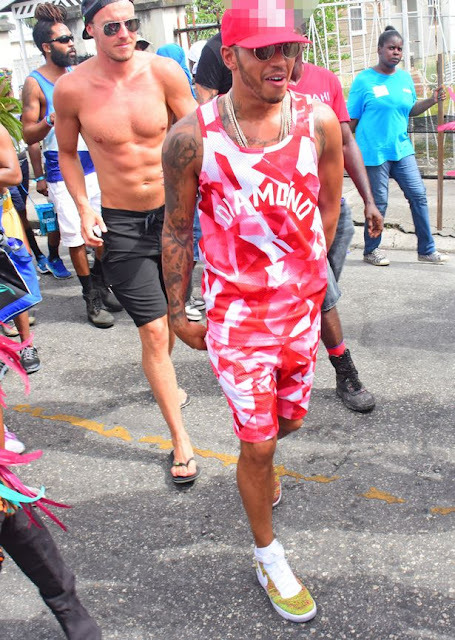 The Crop Over Festival in Barbados sees some of the biggest stars in showbiz turn out each year, strip off, and let their hair down with wild dance moves. And while Rihanna stole the limelight last year, it was over to Lewis Hamilton this time round. The F1 ace showed off his vibrant style in a bright pink camouflage outfit, matching up his shorts and t-shirt, and standing out a mile off. Appearing on Cloud Nine, Nicole Scherzinger's ex quickly mingled in the crowd and was swamped by scantily-clad women.